US Defense Secretary Robert Gates dismissed on Saturday accusations that the United States applied a double standard on the nuclear issue by supporting Israel while calling for Iran to abandon uranium enrichment. 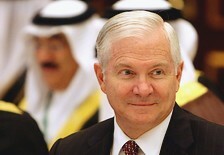 Gates attends the opening ceremony of the IISS conference in Manama, Bahrain. Gates responded to questions about Israel's 'nuclear program' without implicitly confirming Israel possession of nuclear weapons. "Israel is not training terrorists to subvert its neighbors. It has not shipped weapons into a place like Iraq to kill thousands of innocent civilians covertly," Gates said. "So I think there are significant differences in terms of both the history and the behavior of the Iranian and Israeli governments. I understand there is a difference of view on that," continued the US defense secretary. Israel admits to having two atomic reactors, describing them officially as research facilities. Gates also said that Persian Gulf nations must demand that Iran come clean about its past nuclear ambitions and openly vow not to develop such weapons in the future. "Everywhere you turn, it is the policy of Iran to foment instability and chaos, no matter the strategic value or cost in the blood of innocents - Christians, Jews and Muslims alike," Gates said in a keynote address at the international security conference. "There can be little doubt that their destabilizing foreign policies is a threat to the interests of the United States, to the interests of every country in the Middle East, and to the interests of all countries within the range of the ballistic missiles Iran is developing," he continued. And in a sarcastic riff, he goaded Iran to acknowledge its bad behavior - from arming terrorists in Iraq to its support for Hizbullah and Hamas. Some questioners challenged his thinking on Iran, underscoring the divide among Arab nations over America's tough stance on Teheran. Asked if the United States would be willing to talk with Iran, Gates said the behavior of Iran's new leadership "has not given one confidence that a dialogue would be productive." Noting that Iran embraced the recent US intelligence estimate that concluded it had actually stopped atomic weapons development in 2003, Gates drew chuckles from the crowd when he suggested that Iran should accept that all other intelligence conclusions about its conduct are true. Earlier this week, Iranian President Mahmoud Ahmadinejad hailed it as a "declaration of victory" for his country. "In reality, you cannot pick and choose only the conclusions you like of this National Intelligence Estimate," Gates said. "Since that government now acknowledges the quality of American intelligence assessments, I assume that it also will embrace as valid American intelligence assessments of its funding and training of militia groups in Iraq." Gates' rebukes didn't reach any Iranian ears directly, since Iran abruptly decided not to attend the gathering, organized by the London-based International Institute for Strategic Studies. While Gates used the intelligence estimate as a hammer against Iran, the report has bruised the Bush administration. The findings were in stark contrast to a 2005 estimate that said Teheran was continuing its weapons development. And it flies in the face of US President George W. Bush's rhetoric on Iran, especially contrasting with a statement he made in October when he said that people "interested in avoiding World War III" should be working to prevent Iran from having the knowledge needed to make a nuclear weapon. The administration has acknowledged that the report may make it harder to build international support to persuade Iran to give up its uranium enrichment program. When asked about it, Gates agreed the report came at an awkward time and "it has annoyed a number of our good friends, it has confused a lot of people around the world in terms of what we are trying to accomplish." Gates, in his speech, pressed Gulf nations to back sanctions to force Iran to suspend enrichment, and to demand that Iran "openly affirm that it does not intend to develop nuclear weapons in the future." In a complex region where partnerships do not come easy, Gates said the countries need to pull together and develop regional air and missile defense systems. Gates, who was in Iraq earlier this week, also issued a stern call for the Gulf nations to cast aside their sectarian differences and support the struggling new government there. "The progress is real. But it is also fragile," he said. "The Iraqi government must use this breathing space bought with the blood of American, Coalition and Iraqi troops to pass critical legislation." He told the gathering that the decline in violence is due to new military tactics, the improved Iraqi military, the decision by some militants to reject terrorism and the "groundswell of ordinary citizens who have risen up to fight against al-Qaida." Nations in the Middle East, he said, have the most to lose if Iraq dissolves in chaos, and the most to gain if it becomes a stable, secure trading partner. "I urge you to exercise your influence with the Iraqis and encourage them to meet their own goals and expectations, to live up to their own promises," said Gates. "For other Arabs to withhold support and friendship because of the composition of Iraq's government ... is to increase the risk of the very outcome many in the region fear." Gates ended his speech with a grim warning against underestimating the United States. Some countries, he said, "may believe our resolve has been corroded by the challenges we face at home and abroad. This would be a grave misconception." Nazi Germany, Imperial Japan, Fascist Italy and the former Soviet Union all made that miscalculation, Gates said. "All paid the price. "All are on the ash heap of history." Gates' stop in Bahrain is the last stop on a frenetic, week-long tour of the region, which included meetings with military commanders on the battlefields in Iraq and Afghanistan.